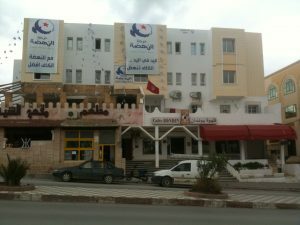 Next Sunday, October 23 2011, elections are held in Tunisia. 116 parties join. The chosen ones will gather in an assembly to write the new constitution of the country. The world is watching. Will the Tunisian achieve in holding peaceful, free, transparent elections? nonfiXe talked to politicians and voters, trying to temp the ambiance, in Tunis, Kef and Sfax. The head quarters of Ennahdha in Kef. Tunisia was the first Arab country to rise against dictatorship and a lightning example to others. After the toppling of Zine al-Abedine Ben Ali, Egypt walked Tahrir square, Libya fought Gaddafi, Syria’s Assad came under siege and regimes in the whole region rocked to their foundations, because all of a sudden people are prepared to pay with their lives for freedom. 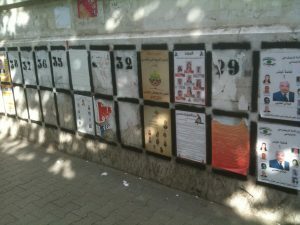 Next Sunday, October 23 2011, elections are going to be held in Tunisia. 116 parties join in. The elected will gather in an assembly to write the new constitution of the country. The world is watching. Will the Tunisians achieve peaceful, free, transparent elections? nonfiXe talked to politicians and voters, trying to temp the ambiance, in Tunis, El Kef and Sfax. At the headquarters of the Islamic Ennahdha movement in El Kef, October 15, people walk in and out in excitement. Today’s campaigning event went fine. Ennahdha is expected to win a majority these elections, even though there are still a lot of Tunisians afraid the party will try to implement strict Islamic regulations. Ennahdha, often mentioned in one sentence with the Muslim Brotherhood, denies all allegations in respect of fundamentalist ideas and discrimination of women. Mr Kadour spent four years in jail where Ben Ali’s men tortured him. As a consequence of this, his left shoulder hangs lower then his right, the hand swags along like a dead animal behind a wagon. His left eye looks like a dazed star and speaking is difficult. He is lucky, he says. His wife stood with him, all these years. Although he was not allowed to work and had to report at the police four times a day after his release from jail. This little scarred man is not a criminal, he was an opponent of the Tunisian regime that held the country in a tight smothering grip for 23 years. Today, seventeen years after his release, he finally can open up about his membership of the Islamist party Nahdha – short for Ennahdha. A party that was forbidden for decades. Ennahdha (Renaissance) writes in it’s English version of the program that it is a movement for justice, freedom and development of Tunisia: ‘Anyone who studies the path of Tunisia’s civilization and culture over the last 150 years can perceive a three-dimensional public awareness within society and its cultural, political and administrative elites. The first is an awareness of the country’s civilizational backwardness compared to the progress achieved by western nations, which has given rise to power, pride and prosperity thanks to the liberation of minds from illusions and the freedom from despotic rule. The second is a deep consciousness of the absolute necessity of bridging this gap by making every possible effort to acquire modern science and technology and develop administrative and political institutions so as to achieve efficiency, develop effective means of production and avert the scourge of despotism. The third is a deep awareness of, and confidence in, the validity of Islam and its heritage as a value and cultural reference and a basis for this project of reform and modernization through ijtihad (creative interpretation), tajdid (renewal), and the activation of dialogue with the contemporary concerns, sciences, and achievements of the modern age. These dimensions form the essence of the reform project and their relative significance continues to be the subject of ongoing debate.’ You can read the English summary of the program on the website of Ennahdha. After January 14, 2011, dictator Ben Ali finally resigned, or better fled. He was the first Arab dictator that succumbed to his people. One of which is with us today, visiting the Nahdha quarters in the city of Kef. Her name is Emna Dabbech, she is 21 years old and has to be in at the Tunis university campus before nine at night. Emna is always on time, but not last January when she spent days and nights at Kasba square in Tunis, shouting ‘Dégage’ and demanding freedom for herself and her people. Emna belongs to the brave facebook activists that organize themselves through social media and raise numbers, masses, to protest. She has the open face of youth and hope, certain of a better future, a free future. This revolution is the revolution of the young with the scent of jasmine hovering over it. ‘We will never allow dictatorship again’, Emna states with determination, in between translating Kadour’s words at the Nahdha headquarters. ‘Thirty thousand of us have been in prison,’ Mr Kadour explains. ‘I lost my brothers and dear friends.’ He insists on telling their names. His soft voice merges in the words of other party members that flow into the room. Everybody wants to be heard. They all have stories like Kadour. ‘I am very proud of yesterdays’ demonstration against Nessma. We showed that we can object without violence,’ Mrs El Omri says. Nessma is the television broadcast that showed Marjan Satrapi’s Persepolis. A film celebrated in the West, but considered blasphemy in Islam spheres due to a drawing of Allah. Tunisian sources say the big demonstration against the tv station is also due to the opportunist policy of the director who openly praised Ben Ali when he was in power and now claims to be a front runner on freedom of speech. The upheaval around Persepolis shows Tunisia’s struggle with the practice of democracy; What is freedom? How far can one go? How to deal with the grey area of one person’s liberty and the other’s sensibility? In the case of Nessma Tunisia chose to vote with their feet, advertisements were withdrawn and the majority protested peacefully, blocking the channel from their tv-sets. Only a small group of Salafists choose the violent way, threatened the director and threw stones. ‘That is not the Ennahdha way,’ Mrs El Omri states with kind persistence. This article is among the sources for ‘Asfour, on betrayal’, novel by Caro Sicking.